As outlined in the August 2006 newsletter, our public water supplies are becoming increasingly contaminated with hundreds of pharmaceuticals, bioactive agents, and the metabolites of chemotherapy drugs. Simply put, every drug or chemical that is administered to a person or animal in this country, adds to the toxic burden which has already been created in the waterways of the World by industrial and agricultural activities. Drugs do not just disappear after they are swallowed: in various forms they recycle into the water, the earth, and the air. They may persist in the environment for days, weeks, or decades. Although their effects are unstudied, they are already both pervasive and apparent. Government mandated health care has been a mixed blessing, and mostly inept and dangerous in recent history. With surprising speed, large numbers of states are mandating that all female children be vaccinated with a new Merck vaccine for HPV (Gardasil). Mandated vaccination adds up to multiple billions of dollars in sales each year for our fat cat friends at Merck. This vaccine has been tested for only four years, so its long term benefits and risks are unknown. Furthermore, it may be necessary to revaccinate every 5 years. As reported by Dr. David Williams in his March 2007 newsletter; "Merck is funneling money through an organization called ‘Women in Government’, an advocacy group made up of female state legislators from all over the country. Many of the bills currently being considered have been introduced by members of Women in Government. A top official from Merck’s vaccine division also sits on the Women in Government business council." A Taiwanese study randomly assigned 146 chronic lower back pain patients to receive either standard physical therapy or fifteen-minute acupressure treatments (six treatments over four weeks for both groups). At the end of the study, the average pain scores had decreased from 9.29 (baseline) to 2.28 in the acupressure group and from 7.68 to 5.13 in the physical therapy group. Interestingly this study also revealed what is becoming increasingly frequently uncovered in research studies, namely that the benefits of the acupressure treatment mounted over time after completion of the study period. At a six-month follow up, the pain score in the acupressure group had further decreased to 1.08, compared to a decrease to 3.15 in the physical therapy group. (Preventive Medicine, Vol. 39, 2004, pp. 168-76). In a Japanese study, 33 patients with mild to moderate dementia were assigned to received either Ba Wei Di Huang Wan (Eight-ingredient Pill with Rehmannia), 7.5g/day or placebo for 8 weeks. At the end of the study period, the treatment group showed significantly improved cognitive functioning and ability to complete day-to-day activities, compared to no improvement in the placebo group. The herbs were also found to increase cerebral blood flow. (Geriatrics and Gerontology International 4 (s1), S124-S128). This joint study carried out by the University of Michigan and the Beijing Heart Lung and Blood Vessel Research Center compared 102 children who took Chinese herbal medicine (CHM) for their mild intermittent asthma with 109 children with similar asthma who used only western medicine (WM). The children using only WM were three times more likely to make hospital emergency department visits, twice as likely to report symptoms and five times as likely to use bronchodilators as children using CHM. (11th Annual Symposium on Complementary Health Care 2004). A Chinese herbal medicine known as ‘SH’, that has proven effective in helping combat HIV infection, is expected to go on the market in early 2005. It is the result of 20 years of development and cooperation between the Kunming Institute of Biology and Thailand’s Ministry of Health. The compound, which has completed three stages of clinical trials in Thailand so far, is now pending review and approval from China’s State Food and Drug Administration. The medicine has already been approved by the Thai medical authorities for market release. In a small study, 15 people with heart failure were assigned to receive 2 one-hour tai chi classes twice a week for 12 weeks, in addition to standard medical care, and compared to a similar sized group who received standard care alone. The tai chi participants demonstrated significant increases in six-minute walking distances, reported better quality of life and had improved oxygen uptake compared to the control group. (American Journal of Medicine, October 2004). Two hundred and fifty-six healthy, physically inactive adults (aged 70-92) were randomly assigned to a Tai Chi group or an exercise/stretching group in this six-month study. Members of the tai chi group showed improvements in measures of functional balance accompanied by significant reduction in the risk of falls, compared to the controls. (Medicine & Science in Sports & Exercise. 6(12):2046-2052). In this study, 118 inactive but healthy men and women, aged 60 to 92 years with moderate sleep complaints, were randomly assigned to a tai chi group or a low impact exercise group. The tai chi group learnt a simplified yang style, whilst the exercise group were taught seated exercises which emphasized controlled breathing, stretching and relaxation (less physically demanding and with less meditation component than the tai chi group). Both groups met for one hour, three times a week, for 24 weeks. At the end of the study, the tai chi group reported significant improvement in five out of seven sleep parameters compared to the exercise group. There were no differences between the groups in use of sleep medication and daytime dysfunction, but the tai chi group scored significantly better on all physical measures and quality of life scores. (J Am Geriatr Soc 2004; 52: 892-900). This Hong Kong study randomly assigned 132 healthy post-menopausal women to supervised tai chi (45 minutes each time, five times per week for a year) or 74 to a non tai chi, inactive (sedentary lifestyle) group. At the end of the study, the tai chi group members showed a slower rate of bone mineral density loss (at the lumbar spine, proximal femur and distal tibia) and a reduced fracture rate. (Arch Phys Med Rehabil 2004; 85: 717-22). A systematic review of 47 tai chi studies has concluded that tai chi appears to have both physiological and psychosocial benefits, and is safe and effective in promoting good balance, flexibility and cardiovascular fitness in older patients with chronic conditions. (Arch Intern Med 2004; 164: 493-501). Thirty-three adults, mostly men, ten of whom suffered from cardiovascular disease, undertook three ninety minute yoga and meditation sessions a week for six weeks. There were significant reductions in blood pressure, body mass and pulse rate across the whole group, but those with cardiovascular disease also showed big improvements in endothelial function, the lining of the arteries becoming more flexible. (American Heart Association Meeting, November 7, 2004). Over 40% of the population was currently taking at least one prescription drug in 1999-2000 (the most recent year for which data have been published), and 16.5% were taking at least three. Other data from the study shows an increase in life expectancy, small reductions in heart disease, cancer and stroke, a 9.3% increase in health spending and a dramatic rise in obesity in the 20-74 age group, from 47% in 1976-80 to 65% in 1999-2000. (US Centers for Disease Control and Prevention). For over 30 years corticosteroids have been used routinely to treat serious head injuries. However a randomized trial of over 10,000 adults with head injuries - the first clinical trial to investigate the effect of corticosteroids in preventing death after head injury - was stopped early after it was found that the risk actually increased. The study authors say that around 10,000 patients may have died as a result of being prescribed these drugs after head injury. Steroids are also used to reduce inflammation in spine injuries; however no large-scale clinical trials have been done to see if they are beneficial or harmful. (The Lancet, Volume 364, Number 9442, Oct. 2004). Merck’s top-selling arthritis medication, Vioxx, has been voluntarily withdrawn from sale after a study raised fears that it could have resulted in more than 140,000 heart attacks in the US alone, of whom 60,000 died, making it the world’s worst ever drugs disaster. Questions have been asked about when Merck knew of the cardiac implications of Vioxx. Earlier suggestions that Vioxx might have cardiovascular side effects were met by Merck with a US $100 million a year consumer marketing campaign to assure that Vioxx was safe. The role of the US Food and Drug Administration (FDA) and its relationship with drugs companies has also been questioned. Data suggesting the possible cardiovascular side effects of Vioxx have been in the public domain for several years, yet at no point did the FDA ask for clinical trials to elucidate the matter. And according to an article in USA Today, the FDA even contacted the editor of The Lancet in what David Graham, the lead author of an article detailing the results of the study, claims was an attempt to prevent its publication. Publication of the study could have embarrassed the FDA, which has been criticized for not warning patients earlier about Vioxx’s cardiovascular risks. New research, which analyzed the records of 8688 British patients, has revealed that abrupt cessation of NSAIDs increases the risk of heart attack within the first few weeks by nearly 50%. For patients taking NSAIDs for lupus or rheumatoid arthritis, the risk was threefold. The researchers suggest that rapid cessation causes inflammation and platelet aggregation to develop very rapidly. (Arch Intern Med. 2004;164:2472-2476). Sometimes, when people seriously suggest expensive, nitwit ideas to solve medical problems, you wonder if they have any conception of what real medicine requires. 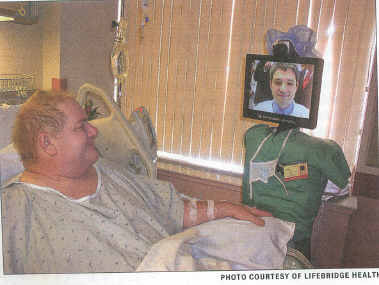 It is sadly indicative of the state of medicine today that articles such as "More Often, Doctors Visit Bedside via Robot" can be found in the professional press. This article, published on page one of the February 19th AMA News, details an idea so incredibly stupid that it deserves special attention. 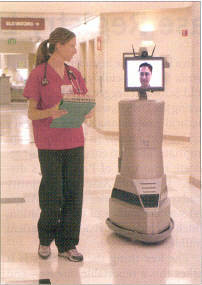 In summary, the idea is that a doctor can "see" a patient "from coffee shops, home, or elsewhere" through a video and audio link on a motorized platform, which is vaingloriously being termed a "robot". According to the American Medical News, "the machines cut response times for intensivists and surgeons, allowing them to see patients more quickly." Folks, I'm here to tell you that what people who are in places where "intensivists and surgeons" practice, what you need is quick evaluation and treatment, which requires someone to be right there, in the same place as the patient. Yes, the doctor can look at a monitor and listen to the patient through the speakers on his laptop, but this is laughably inadequate to evaluate a seriously ill patient. Obviously, providing treatment is not an option for our "video doctor" who needs a qualified nurse or doctor on the spot to do the work. For the cost of this witless program, better to hire more registered nurses. For the alert and comfortable patient pictured in the above photo a "visit" by the doctor with this gadget is of no more medical value than a phone call. That there is anyone even remotely involved in medicine that thinks that having 100 of these expensive 220 pound machines wheeling around hospitals under remote control is a good idea is incredible in of itself. But that otherwise presumably intelligent doctors and nurses would think that this is a substitute for a real hands-on interaction on any level is simply astounding science fiction. "It's really easy to operate. We just need someone to push the elevator button because the robot doesn't have any arms", gushes Paul M. Vespa, M.D., director of neurocritical care and associate professor of neurosurgery and neurology at the David Geffen School of Medicine at UCLA. Despite his title, I believe Dr. Vespa and the rest of the participants in this program could use a refresher course in critical thinking.